I'm seeing small, repeating patterns of vinyl decals all over the interwebs lately and in some of the funnest, sweetest, trendiest shapes and layouts. Evenly spaced or randomly placed, these little decals add a big punch, often mimicking the look of wallpaper without (gasp!) all the work and a whole lot more fun. We did a round-up of gold polka dot walls last week (another big trend) and we've been collecting other polka dot walls on this Pinterest board, but polka dots aren't the only little decals making a big impact. In fact, we've got quite the collection of decal kits over in the shop, and so thought we'd highlight some of our favorite iterations and inspirations on the blog today. Check out these fabulous rooms - I just love how the decals end up being the perfect finishing touch for a carefully planned and put together space. And then - visit the shop to find just the right decal kit for your own space. Go forth and conquer, friends! Oh, hearts. Of course. This little girl's room, featured on Apartment Therapy, is all kinds of awesome. I love how all the eclectic elements come together so well. And the gold hearts just make that statement wall, don't they? Get your own heart decals here - in gold, yes, or in any other color you heart (teehee) desires and spread the love all over. 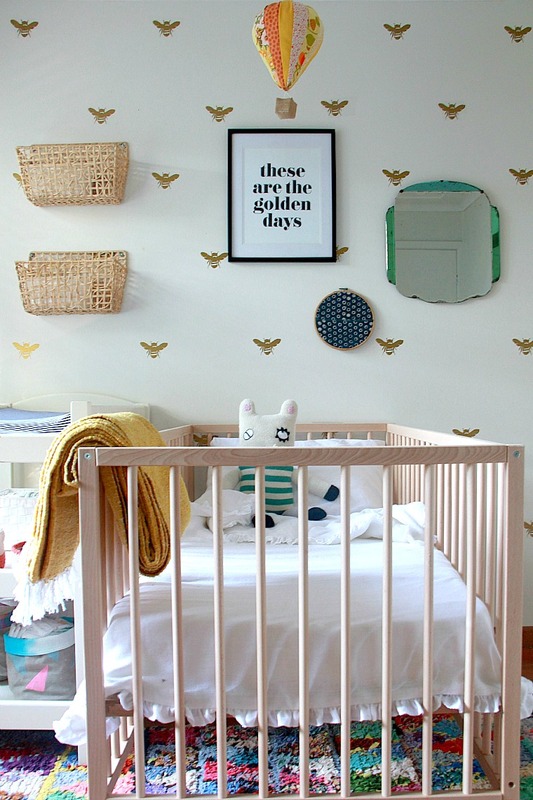 Have you seen this adorable nursery at The Beetle Shack? Oh my goodness. I'm loving everything about it. And those bees! We created our own bee decals so you too could add a little of that adorable to your own walls. Fun fact - this pattern (the plus signs), very much on trend with modern and Scandinavian design, is called the Swiss Cross - probably inspired by the Swiss flag - and is "one of the most popular patterns in design today" (so declares Apartment Therapy's Taryn Fiol). We're seeing it most often in textiles - rugs, bedding, pillows, etc. In fact, that's where I first saw it - in a wool blanket on a Finnish design blog (sure I couldn't read a word, but my goodness the photos!). We thought these would be perfect on the wall (Pinterest does too, by the by) and so we've created Swiss Cross decals to help you add a little easy modern European style to your home. Hexagons are the perfect complement to this adorably modern little room and I'm seeing them in the coolest places (like on washing machines! and gold in entryways - gold is such a thing these days, eh?). A little geometric love goes a long way. Get your own hexagon decals here and you know, go wild.